You can follow the discussion on And another by entering your email address in the box below. You will then receive an email every time a new comment is added. These will also contain a link to a page where you can stop the alerts, and remove all of your related data from the site. Was hoping you would remain steadfast in the midst of Pitti silliness. I was mistaken. This look is not bad at all! Enters in a room and stuffs the shawl in the hat. Hi Simon I was wondering if you saw the Savile Row fashion walk at Spencer House on Tuesday? While there was a plethora of male models and some not very well fitting clothes there was also some beautiful stuff by Anderson and Shepperd and all the usual. I saw one piece that no-one knew who it was by however, worn by a young chap who did not seem to be a model but rather as if they were his clothes. He is wearing a grey suit and blue overcoat in the fourth photo in this series and I would really love some help if you could tell me more. I believe its a young man called Harry Mundy, correct me if I am wrong though. I have seen him about London wearing his creations, very exciting chap. His website is coming live soon apparently, http://www.harrymundy.co.uk – there’s an email address on there. I was in Florence as a tourist during the Pitti days. While walking in the streets, you could easily recognize people who were there for the tradefair. Most wore a “uniform” made of narrow trousers (usually quite short, showing fancy socks), a slim jacket and a big shawl (and many had huge shoes or double monks). Simon this ensemble is beautiful. I think because of the specific lighter-than-navy blue. I also wouldn’t have guessed that a cloak could look so elegant but at the same time unobtrusive. Can I just ask though, which specific Lock hat it is? 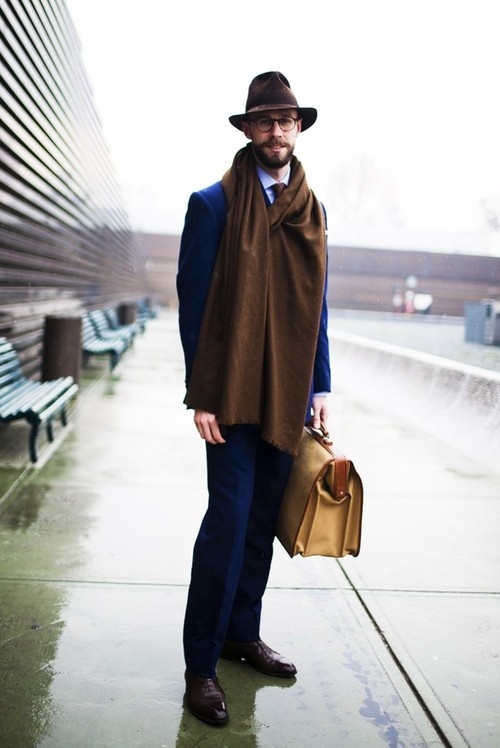 Is it the roll-up in a tube travel hat, or the standard trilby? And if the latter what is the brim width? It looks excellent. Sorry, the shawl/pasmina just seems like an affectation. I cannot believe people in the clothing industry do not own proper raincoats. It’s only 100 yards from the covered walkway to the entrance, and carrying one around all day after that is a real pain. Yes I know what you mean. I quite like the debate though. If there were only one view on any of these things it would be pretty dull. Sorry, but it just looks dreadful. A pacamac would’ve done the job better! I’ve been thinking about this look since Simon first posted it. I don’t understand why so many of you guys are against the shawl!? My compliments to Simon for tempting to replace the cumbersome raincoat with something more efficient, especially for Pitti. After all, creating a good look is about merging style with function, not only about aesthetic. On a side note to Simon: I really like the way you draped the shawl. It kind of reminds me of the classic Italian Tabarro. I don’t know if you had the tabarro in mind when you chose to wear the shawl, but either way, you’ve got my vote on this one. Culturally relevant, easy to manage, and totally awesome! Thanks Miekka. I was just aiming for maximum protection of the shoulders and back, but good to know the reference! I have nothing to add about your attire, but just wondered who the lovely lady to the left in the photo is? I stopped going to Pitti 3 years ago when I saw it was a waste of time (to a designer that doesn’t follow mainstream fashion). I must agree it was a circus of fashion victims hanging around that main plaza hoping to get pictured. 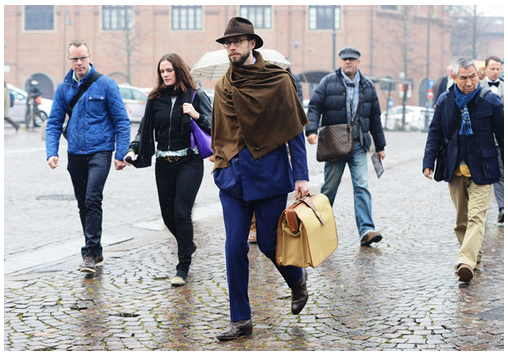 ‘This year is the funky 70’s hat and shawl look’ or ‘Lapo says its camouflage time’ …. plenty of fashion and over grown dandies rather than style and stylish Gents. Having said that, many great dressers and outfits, and a few (minority) interesting exhibitors. For what its worth, Mr. Crompton pulled it of quite subtly IMO (that’s a good thing in my books).